Money laundering, taking proceeds of crime and turning them into “legitimate” currency or assets, and its more modern derivative terrorist financing, are not new ideas. No one can put an exact time on the earliest money launderers, but there is evidence of Chinese merchants as far back as 2000 years ago hiding their wealth from rulers who would simply take it from them and banish them from where they lived. In addition to hiding the money, they would move it around, investing in businesses in different provinces, and, in some instances, getting the money out of the country altogether. So, it’s clear that money laundering, in one guise or another, has been a part of societies through the ages. However, it is a problem that is becoming increasingly prevalent, not to mention ever-more sophisticated. By its very nature, it is incredibly difficult to put an exact figure on the value of global money laundering. The most recent estimations suggest it accounts for between 2-5% of global GDP, meaning that anywhere from US$800 billion to $US2 trillion are laundered globally every year. Quite staggering numbers by anyone’s reckoning. Coupled with the increase in a criminal’s ability to launder their cash in new ways, often through technology, it illustrates that the problem is perhaps now in the worst it has ever been. As criminal enterprises use increasingly sophisticated technologies, it is more difficult than ever to stop the problem worsening. Money laundering, and its use in terrorist financing, represents genuine threats to life and society. Given that, when it comes to client inception there can be no grey area in lawyers KYC processes. 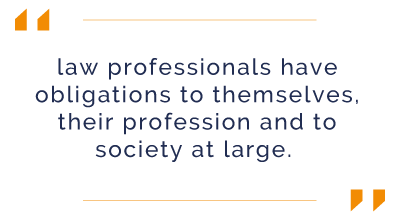 Put simply, law professionals have obligations to themselves, their profession and to society at large. The onus is on them to act with integrity, uphold the rule of the law and be vigilant in preventing themselves from facilitating any criminal activity. It cannot be understated how vital it is that the law profession remains constantly aware of the potential threat of criminals seeking to misuse legal professionals to facilitate money laundering and terrorist financing activity. Realistically, it is impossible to eradicate money laundering. The sheer scale of many of the operations make it something that can not be stopped entirely. However, it goes without saying that we must try. Regulatory bodies in the law industry have also taken this approach. They are aware that stopping it altogether is difficult, but every practice having a robust AML/KYC process is a major step in the right direction. Having a standardised process that is followed during every potential client onboarding not only allows for the practice in question to stay on the right side of regulation, it also shows clearly that they are consistently taking the appropriate preventative measures to ensure that their practice is not facilitating any sort of criminality. One potential problem of a process being carried out manually, however, is the human element. When people read information, or in this instance perform a company’s standard client inception process, it is inevitable that the checks carried out will differ slightly from person to person. Couple that with the volume of information contained in a standard KYC process, it is more than reasonable to suggest that certain pieces of information may be skimmed over, and in some cases, missed altogether. The ability or ethics of the individual(s) carrying out the checks should not automatically be in question, but there is always an element of human error in all manual tasks, it is unavoidable. But there is a solution on the horizon. FinTech, or financial technology, has moved from the fringes to the very heart of financial services. With solutions taking advantage of advancements in artificial intelligence and automation, FinTech has, or is in the process of, revolutionising almost every aspect of how the financial sector operates. With increasingly onerous and ever-shifting regulatory and compliance regulation applied to the sector, many companies are now developing solutions in RegTech, or regulatory technology. Such developments are relevant not only to those working in banking and investment. Any company or organisation operating in a regulated environment is assisted in keeping on the right side of legislation and internal policies. This is particularly pertinent to those carrying out AML/KYC checks, as we have seen. The way in which people launder money continually evolves. The difference now is that there has been a huge leap in the tools available to those trying to stop it. The question is, if the tools are available, and the legislation demands more stringent ways of carrying out these checks, is it time for the legal profession to fully embrace RegTech? Of course it is. One such tool that has been embraced by the legal profession is encompass verify for Law. encompass verify allows firms to quickly and accurately determine Ultimate Beneficial Owners (UBOs), who holds directorships, and financial details at the touch of a button. 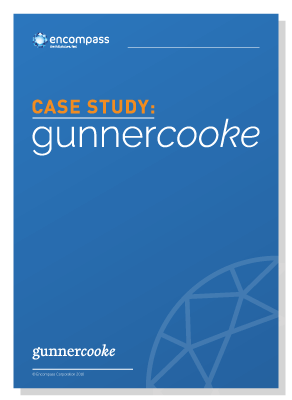 encompass have worked with clients such as innovative law firm gunnercooke who have used encompass verify to free up the time of their senior lawyers to work with their clients. Chris Jones, an expert in restructuring and business development, and partner at gunnercooke, has been searching for company information on Companies House for over twenty years. What he found on moving to encompass verify, was that “three hours of a senior lawyer’s time is reduced to 30 seconds, while producing a result with significant improvement in accuracy compared to the long-established way of searching”.